This article is taken from a chapter in The NEXT PROPHECIES book by Bill Salus. The NEXT PROPHECIES is the long-awaited sequel to The NOW PROPHECIES book. Some of today’s top Bible prophecy teachers believe that the Ezekiel 38 prophecy could happen at the present time, but is it a NOW or a NEXT prophecy? The NOW Prophecies are the unfulfilled ancient biblical predictions that appear to be imminent, which means they could happen NOW! These prophecies have either minor or no remaining preconditions inhibiting them from happening. Whereas, the NEXT Prophecies have at least one or more significant preconditions prohibiting their final fulfillment. The Ezekiel 38 prophecy could rightfully be classified as a NEXT prophecy for a few of the reasons that are identified within this article. The Ezekiel 38 prophecy is detailed in Ezekiel 38:1 – 39:20. In the NEXT PROPHECIES book, these verses are exposited upon in the following manner. What are the conditions in Israel before the Gog of Magog invasion? (Ezekiel 38:1-13). What are the conditions in Israel during the invasion? (Ezekiel 38:14-39:8). What are the conditions in Israel in the aftermath? (Ezekiel 39:9-20). Ezekiel 39:21-24 provides information about the awarenesses that the Jews and Gentiles should glean as a result of the fulfillment of the Ezekiel 38:1-39:20 predictions. Ezekiel 39:25-29 briefly summarizes the process of the regathering of the Jews into Israel, which ultimately leads to the national conversion of Israel through a faithful remnant who survives the seven-year Tribulation period. “When the plain sense of Scripture makes common sense, seek no other sense; therefore, take every word at its primary, ordinary, usual, literal meaning unless the facts of the immediate context, studied in the light of related passages and axiomatic and fundamental truths, indicate clearly otherwise.” –Dr. David L. Cooper (1886-1965), founder of The Biblical Research Society. The economy of Israel will be thriving, because the Ezekiel 38 invaders are coming, (to take plunder and to take booty). (Ezekiel 38:12). Conditions #1 and #2 above appear to be in place, but conditions #3 and #4 are not and condition #5 may not presently be fully in place. Condition #3 mandates that Israel must be living in peace and experiencing a condition of national security. A few recent headlines suggest that this is not the case for Israel today. Condition #4 is also not in place, which addresses the absence of partition walls and security checkpoints and fences. 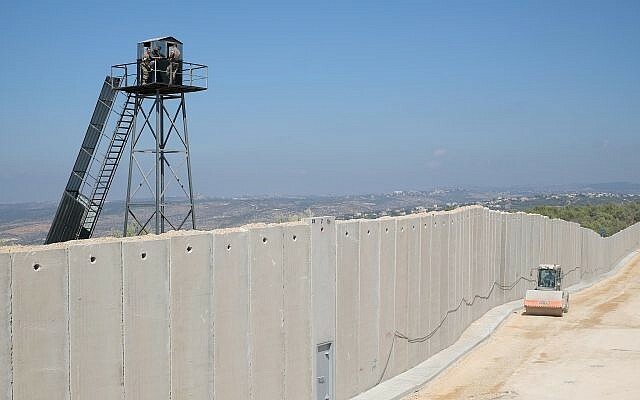 In addition to the fact that Israel presently has a massive 400-plus-mile long partition wall that is at some points 20-feet tall and filled with concrete, check out these recent headlines that further evidence this point. So, if Israel is not currently experiencing the prerequisite conditions of #3 and #4, when will they? Ezekiel answers this question ten chapters earlier. “And there shall no longer be a pricking brier or a painful thorn for the house of Israel from among all who are around them, who despise them. Then they shall know that I am the Lord God.” ‘Thus says the Lord God: “When I have gathered the house of Israel from the peoples among whom they are scattered, and am hallowed in them in the sight of the Gentiles, then they will dwell in their own land which I gave to My servant Jacob. And they will dwell safely there, build houses, and plant vineyards; yes, they will dwell securely, when I execute judgments on all those around them who despise them. Then they shall know that I am the Lord their God.” ’ (Ezekiel 28:24-26). Ezekiel 28 points out in the verses above that Israel, “will dwell securely, when I execute judgments on all those around them who despise them.” As the assorted headlines above have illustrated, Israel is presently surrounded by people around them, who despise them and none of these countries or terrorist organizations surrounding Israel are specifically listed in Ezekiel 38. 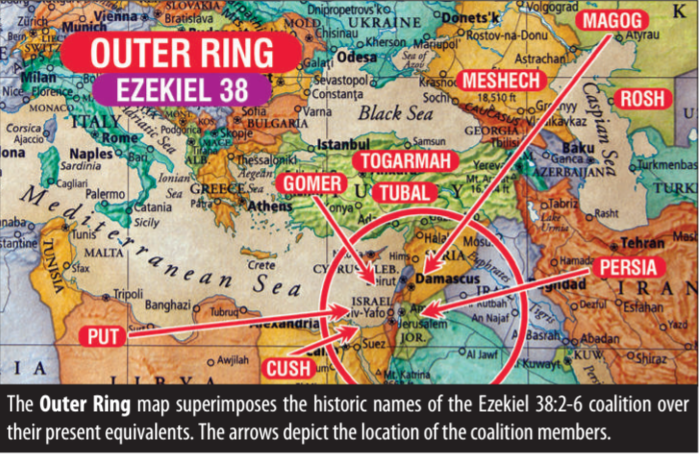 In fact, the Ezekiel 38 invaders, which are depicted in the “Outer Ring” image, share no common borders with Israel, nor have they ever been the historic enemies of Israel. If Ezekiel 28:24-26 is not describing the outer ring of Ezekiel 38, then who are those around Israel that despise the Jewish state? It is important to identify them, because until judgments are executed upon them, Israel cannot dwell securely and meet the prerequisite conditions of #3 and #4 above. It appears that the answer is found in the NOW prophecies identified below. There exists an “Inner Circle” of countries that are displayed in the following image that share common borders with Israel and they are the historic enemies of Israel. They have harbored an ancient hatred of the Jews from time immemorial. In conclusion, as per the prerequisite conditions #3 and #4 above, Ezekiel 38 could presently be classified as a NEXT, rather than a NOW prophecy. However, after the fulfillment of some or all of the NOW prophecies identified above, Ezekiel 38 could then be reclassified from a NEXT to a NOW prophecy. 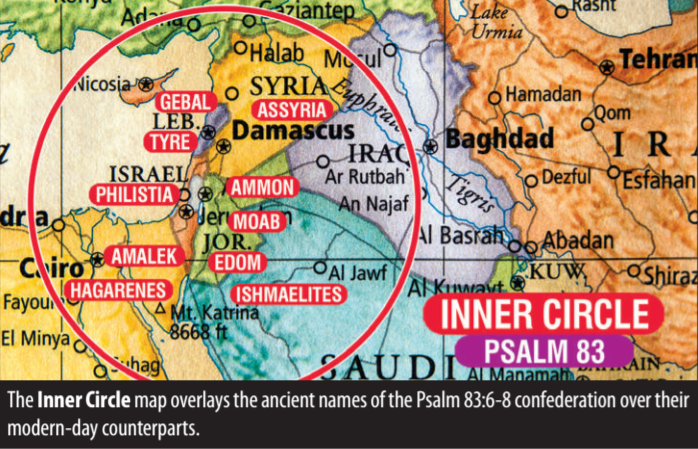 There are some who believe that the NOW prophecies above, especially the final Arab-Israeli war predicted in Psalm 83, are part of the Ezekiel 38 predictions. 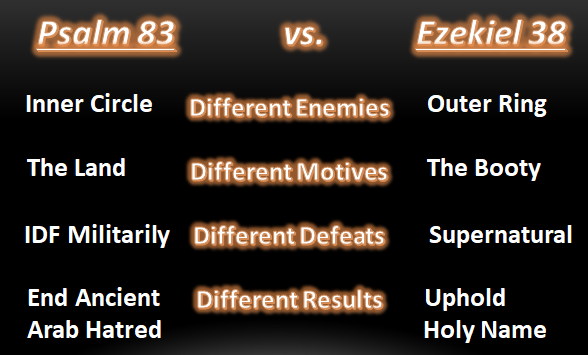 However, as the image below points out, there are several distinct differences between Psalm 83 and Ezekiel 38. For more information about the NOW and NEXT prophecies, pick up the books of the same name. Click HERE to purchase these works. Even though Ezekiel 38 appears to be a NEXT prophecy, there are many reasons to believe that it draws NEAR to the time of its fulfillment. Below is a quote from the NEXT PROPHECIES book that evidences this. “INTERESTING OBSERVANCE: The Ezekiel 39:17 birds of prey appear to be already gathering in Israel. This implies that the Ezekiel 38 invasion, which concludes with the sacrificial meal, draws near. If this is the case, this makes sense because the local birds, rather than those that have to migrate from great distances, would be the immediate benefactors of the sacrificial feast. Some interesting headlines below reference the increased bird populations existing in Israel.